Objectives The aim was to explore the views of professional stakeholders and healthcare professionals (HCPs) on the linkage of UK National Health Service (NHS) data for paediatric pharmacovigilance purposes and to make recommendations for such a system. Methods A mixed methods approach including a literature review, interviews, focus groups and a three-round Delphi survey with HCPs in Scotland was followed by a triangulation process using a systematic protocol. The survey was structured using the Theoretical Domains Framework of behaviour change. Items retained after applying the matrix-based triangulation process were thematically coded. Ethical approval was granted by the North of Scotland Research Ethics Service. Results Results from 18 papers, 23 interviewees, 23 participants of focus groups and 61 completed questionnaires in the Delphi survey contributed to the triangulation process. A total of 25 key findings from all four studies were identified during triangulation. There was good convergence; 21 key findings were agreed and remained to inform recommendations. The items were coded as practical/technical (eg, decision about the unique patient identifier to use), mandatory (eg, governed by statute), essential (consistently mentioned in all studies and therefore needed to ensure professional support) or preferable. Conclusions The development of a paediatric linked database has support from professional stakeholders and HCPs in Scotland. The triangulation identified three sets of core requirements for a new system of data linkage. An additional fourth set of ‘preferable’ requirements might increase engagement of HCPs and their support for the new system. The mixed methods approach of this study used several methods to employ the strengths while addressing the inherent weaknesses of each method. No validated instruments were used; the interview and focus group schedules were based on the initial literature review. The use of a theoretical approach in the form of the Theoretical Domains Framework added robustness to the results of the Delphi, allowed for a systematic exploration of potential problems. The use of a triangulation protocol allowed for a systematic comparison of findings between the different methods used. Reports of ADRs are collected nationally in many countries, for example, Yellow Card Scheme in the UK or the Food and Drug Administration (FDA) Adverse Event Reporting System (FAERS) Database in the USA. However, it is widely acknowledged that these systems underestimate the true prevalence of ADRs.6 ,7 A systematic review of papers published between 1986 and 2006 on the views of healthcare professionals (HCPs) towards ADR reporting found that non-reporting was related to ignorance and lack of knowledge of the reporting system (95%), lack of time or similar reasons (77%), fear of filing an inappropriate report (72%), indifference and uncertainty about causality (67%) and the perception that licensed drugs are safe (47%7). New approaches of signal generation to enhance existing systems are required. There is increasing electronic collection and storage of healthcare data during routine clinical practice for the purposes of more efficient clinical communication and health service administration. However, this contemporary and comprehensive information resource could also facilitate new methodological approaches in population health research, especially pharmacovigilance. Small-scale studies have already shown that identification of suspected ADRs is possible using this routine data.8 It is unclear, however, how stakeholders such as national (Scottish) experts on pharmacovigilance, confidentiality or data protection and HCPs would view the secondary use of routinely collected healthcare data, especially if individual datasets were linked. The research reported here was part of the CHIMES (Child Medical Records for Safer Medicines) programme in Scotland. The overall aim of this programme was to develop a novel paediatric pharmacovigilance system based on linkage of routinely collected data in primary (general practice (GP) and community pharmacy) and secondary (hospital) care. The aim of this research was to provide recommendations for such a national resource that would allow monitoring for long-term outcomes of exposure to medicines during childhood and adolescence. Adverse reactions to medicines could be identified by stop dates, reduction of initial doses or switches of medication. In line with use of other existing datasets derived from routinely collected data, our assumption was that access to the data by researchers would only be allowed after review of the application by an internal ethics, or equivalent, committee. The aim of this study was to explore the views and opinions of HCPs on linking routinely collected data and make evidence-based recommendations for a system of pharmacovigilance based on linked data. This was a mixed methods study which included data from a literature review,9 an interview study,10 a focus group study11 and a Delphi survey.12 All these studies have been previously reported. In this paper, the results of the four stages of data collection are formally triangulated, and recommendations for a new system of pharmacovigilance are made. All studies were approved by the North of Scotland Research Ethics Service and National Health Service (NHS) Research and Development. Summaries of the methods used in the previously reported papers are presented below. Based on the findings of the two qualitative studies, a three-round Delphi survey with HCPs (pharmacists, nurses and medical doctors with an interest in paediatric medicine) in Scotland was conducted to identify consensus on essential system components required for HCPs to support or facilitate the proposed data linkage and continue recording the necessary data.12 A random sample was drawn from national sampling frames of the target populations, using, for example, the NHS Information Service Division workforce lists for general practitioners and practice nurses, a list of registered premises by the Practitioner Service Division for community pharmacists or paediatricians via the Scottish Paediatric Society. The survey was structured using the Theoretical Domains Framework (TDF)13 of behaviour change. A systematic data reduction exercise based on methods proposed by Prior et al14 was applied between Round 1 and 2. Consensus criteria for each round were set a priori at 66.7% for Round 2 and 90% for Round 3. A triangulation protocol based on the methods proposed by Farmer et al15 was applied to interpret and integrate key findings from the literature review and the three empirical studies in order to identify essential system components. These methods proceeded in three steps. First, a matrix was constructed to allow comparison of key issues against those as represented in the individual studies. Second, themes were compared to create a single list of issues, barriers and facilitators based on the individual study results. Third, agreement between studies was coded using a convergence coding scheme as presented in table 1. ‘Agreement’ indicates that the key finding was identified in a particular study, ‘partial agreement’ means that the finding was partially covered, and ‘disagreement’ indicates a contradictory finding. If none of these three codes could be attributed, the label ‘silence’ was used. In the literature review, which was conducted in 2011, a total of 2917 titles were screened and 18 papers were included, describing the views of HCPs on linking or sharing healthcare data at an individual patient level.9 These showed that data sharing at a patient identifiable level was more common than population-based data linkage. Data sharing was often described within specific settings, such as an emergency department or a specialist ward or the pharmacy department of a hospital. HCPs who reported a previous positive experience with such data sharing perceived a positive impact on their work and patient safety and were more likely to support data sharing. However, funding (start-up and maintenance), technical problems (compatible Information Technology (IT) systems) and governance issues were identified as potential barriers to successful implementation of data sharing. Between February and October 2010, 25 participants were interviewed from 11 of the 24 Scottish Health Boards.10 Interviewees had positive views on the proposal to use routinely collected data to create a pharmacovigilance resource for children in Scotland. Practical, ethical and legal issues were identified related to the sharing of the data, the ownership of the linked data, consent for data linkage, anonymisation and confidentiality. These results were further explored in focus groups with health practitioners. Between August 2010 and May 2011, six focus groups were conducted with 22 participants from seven different Scottish Health Boards.11 Participants were recruited from all professional backgrounds and from primary and secondary care. Half of the participants were pharmacists (n=11, 50%) and the majority were female (n=13, 59%). Focus group participants reported that governance problems and relevant legislation should be addressed. They proposed that patients would have issues with the use of their data for research purposes, with key areas of sensitivity including confidentiality and third party access to patient identifiable data. Participants supported the proposed linkage, and their range of views was similar to those of the national interviewees. However, more concerns were voiced about funding of such data linkage, particularly if this meant any diversion of funds from their own area of practice. The Delphi study was conducted in three rounds from August 2011 to February 2012.12 The first round of the Delphi study generated over 1000 individual statements from 61 participants. After systematic item reduction, 149 items were retained for the second round, in which participants were asked to rate their level of agreement with each item. Items reaching the consensus criterion of 66.7% were entered into the third round. After the third round, the retained consensus items focused on professional standards, requirements for linkage and the use and form of potential feedback. Overall, the results confirmed that participants were generally willing to facilitate the proposed linkage, dependent on adherence to professional standards, relevant legislation, ethical approval, secure data sharing agreements and support from their employers. Applying the triangulation protocol, a total of 25 key findings were identified across all four studies and the interstudy level of agreement is shown in table 2. Findings showed near perfect agreement (full or partial) between the qualitative studies (23/25, 92%). No disagreement on any finding was noted between the qualitative studies, but each of the qualitative studies had one coding of ‘silence’: Focus group participants did not discuss whether data ownership would have to be clarified, and interview participants did not identify feedback from linkage studies as a facilitator of future support. Four of the 25 findings (16%) from the qualitative studies were not carried forward in the Delphi survey, that is, the predefined consensus criteria were not reached; of the remainder, three results (3/25, 12%) from the survey findings did not reflect the findings from the qualitative arm, namely, the role of the UK NHS as a facilitator of the data linkage, whether benefits outweighed the risks or if professional guidelines would prevent data sharing. All but four of the findings identified in the empirical studies were also identified in the systematic review.9 Understanding of pharmacovigilance and understanding of the current system were not identified in the literature review, nor were the two Scotland-specific findings (NHS as a facilitator or the use of the Community Health Index (CHI) as a unique patient identifier). Essential system components were deduced from the Delphi analysis plus key findings that showed (partial) agreement across at least three studies as listed in table 1. Statutory items, such as legislation, were included as following the law would be the basis of any decision. Key findings were sorted into inductively and resulted in four categories: practical/technical, mandatory, essential or preferable. Practical requirements include the need for meaningful data, the provision of server space for storage and processing the linked data as well as software compatibility across and within the different Health Boards in Scotland. General agreement was that any technical or practical problems could be solved. Mandatory items were those underpinned by regulation or statute/legislation. Literature and participants identified that following ‘relevant’ legislation is important but a definition of relevant was seldom provided or discussed. Focus group participants declined requests to be more specific and referred to legal specialists instead. Indeed, the interview partners with legal expertise identified the widest range of legislative acts and non-statutory guidelines that should be observed. Additionally, participants deemed ethical approval to be important. Essential items were those in which there was (at least partial) consensus across at least three of the four studies (as listed in table 2), for example, that the planned data linkage should not impact negatively on the current workload or clear information governance structures. Participants stipulated that transparency should include informing the public about the new system. Items coded as ‘preferable’ were those that did not match the above definitions but were deemed to increase the stakeholders' support and active engagement with the system. Clear data sharing agreements in place as well as feedback from the linked data resources and an opt-out possibility for patients was deemed acceptable, but HCPs requested to evaluate patients' opinions prior to the implementation of the new system. Figure 1 indicates how the findings resulting from the triangulation process are mapped out displaying the conceptual model for the new system implementation. Building blocks of recommendations for the proposed data linkage system. Practical requirements describe practical and technical necessities for the actual data linkage process, mandatory requirements describe compliance with relevant legislation, essential requirements describe system design options and preferable items describe items that would increase the support from HCPs. ADR, adverse drug reaction; CHI, Community Health Index; HCPs, healthcare professionals; IT, Information Technology. 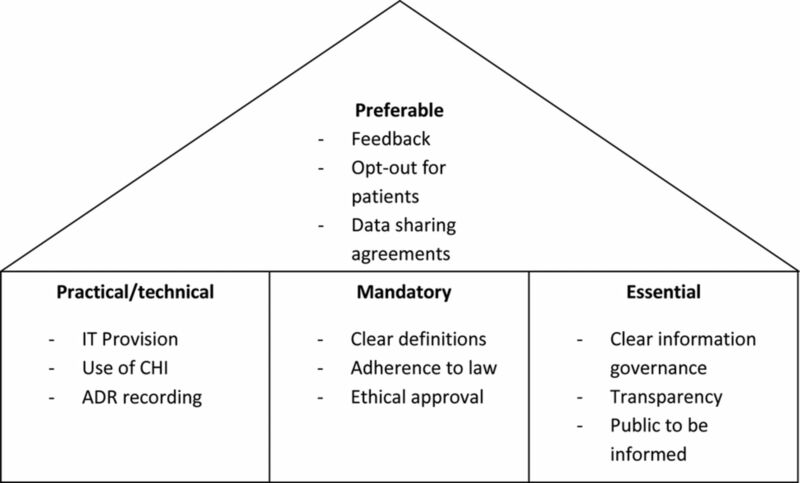 The triangulation process identified three core sets of requirements necessary for the implementation of a new linked data system for paediatric pharmacovigilance, including ‘practical/technical’ requirements as well as ‘mandatory’ requirements such as ethical approval, and ‘essential’ requirements such as transparency. A fourth set of requirements, labelled ‘preferable’, might increase the engagement of HCPs with such a new system. Triangulation has been described since the 1970s16 and was initially defined as ‘the combination of methodologies in the study of the same phenomenon’ (Denzin, 1978, p. 291, as seen in16 ,17). The combination can be across different data sources, investigators, theories, methodologies or data collection methods.16 ,17 O'Cathain et al18 defined triangulation as investigating the same issue using different methods—an approach well suited to mixed methods research. The use of a triangulation protocol allowed for a systematic comparison of findings between the different methods used. The use of a mixed methods approach allowed minority issues in the interviews to be carried forward, that is, issues that were only mentioned by one or two participants. The Delphi survey results that were based on those findings confirmed overlapping findings between the different studies, providing face validity and robustness of the findings against method-based variation. The initial Delphi questionnaire was developed based on the findings from the interview and focus group study in order to present those findings to a larger audience with the aim of gaining consensus on the most important items. Although the questionnaire was not psychometrically validated, it incorporated the use of a tested and validated framework allowing for a systematic assessment of barriers to data linkage, the TDF.13 The TDF accounted for all barriers identified in the qualitative studies, hence confirming good empirical coverage. Using several methods gave the capacity to employ the strengths and address the inherent weaknesses of each method. The single studies involved in the triangulation took place over a period of 2 years. Some of the opinions from the stakeholders and HCPs might have changed over that time. We did not retest their views and opinions a second time. We are, however, confident that this triangulation work does indeed present a good starting point of the requirements for such a suggested data linkage project. Once the proposed system has been implemented, surveys among data providers and data users should be performed on a regular basis to ensure that the way the data linkage is performed and analysed is still acceptable for HCPs. This paper has not considered the opinions of patients/the public towards the secondary use of routinely collected data; these have been explored in a parallel study which is currently being analysed. The proposed data linkage was perceived to be useful for pharmacovigilance research across all methods used in this study. Small-scale studies have already indicated that it is possible to use linked data for epidemiology research19–22 and that linked data can be used successfully for signal generation relevant to possible ADRs.8 Participants indicated conditional support for the proposed linkage, with conditions ranging from anonymisation of the data to ethical approval as well as adherence to legislation and professional codes of conduct. A range of potentially relevant legal frameworks was identified during the interviews including the Data Protection Act 1998, the Common Law Duty of Confidentiality, and the Human Rights Act 1998.10 In the qualitative studies, there was confusion as to which legislation, which guidelines and standards were directly relevant to the proposed data linkage.10 Several statements included potential regulatory and legislative frameworks but did not discuss any of these in detail as it was assumed that ‘relevant’ laws and guidelines would be followed. Despite probing, participants in focus groups did not provide further information on the term ‘relevant’, referring to experts that would be better suited to answer these questions despite the fact that even those experts interviewed commented that these had rarely been formally tested in a court of law. The definition of ‘relevant’ is important for the application of legislation and guidelines, and for the anonymisation of data. Participants also used the term ‘adequate’ in the context of anonymisation of data security measures. However, neither the reviewed literature nor the empirical work provided a working definition of these terms or criteria for ‘adequacy’. It would be necessary to have an agreed definition in order to apply ‘relevant’ and ‘adequate’ measures, and also it would be important to specify who should decide what ‘relevant’ and ‘adequate’ means. Preferable: to increase support and active engagement with the system. ‘Practical’ requirements include the need for meaningful data, in order to have data that are useful and the provision of server space for storage and processing the linked data. A Wellcome Trust report published in 2009 suggested the use of ‘safe havens’ for data linkage projects.25 Software compatibility across and within the different Health Boards in Scotland was also questioned by participants. The lack of a single standard system for reporting and recording medical data has been noted previously.28 Despite this, results indicated that any technical or practical problems could be resolved. Compliance with relevant legislation was seen as ‘mandatory’. The following acts were identified as relevant for the planned project: the Data Protection Act 1998 and the Common Law Duty of Confidentiality. In addition to the law, compliance with professional standards and ethical approval were deemed to be important. For all recommendations, clear definitions are required. This would be in addition to the terms ‘relevant’ and ‘adequate’ as discussed above. ‘Essential’ requirements describe system options that would ensure the support of HCPs for the planned data linkage. One of these requirements would be that the planned data linkage should not impact negatively on the current workload, which is in line with previous findings.29–33 Clear information governance structures were requested across all arms of this study. Concerns about governance including data security, legal restrictions and data quality are not new and have been cited previously as potential barriers to data sharing.31 ,34–40 Potential governance structures could relate to consent and confidentiality structures as well as the use of data sharing agreements. Similar features have been recently described by El Emam et al40 as facilitators for data sharing. Participants also requested transparency about the kind of data used and the research initiated and informing the public about the proposed system. Taking all four categories into account, the first three would describe the basis for the proposed new system, with the fourth increasing support from HCPs (as detailed in figure 1). The proposed data linkage was perceived as addressing a gap in current knowledge. Nonetheless, participants did identify a range of problems and concerns that should be addressed prior to implementation of such a system. Adherence to relevant legislation, such as the Data Protection Act, and the application of appropriate governance, such as adherence to professional standards and the Caldicott principles, were deemed to be important in ensuring confidentiality for patients and prescribers. Although no consensus was reached in the first two studies on the need for consent, the Delphi study identified that the offer of an ‘opt-out option’ for patients would have support from HCPs. The work presented in this paper demonstrates that the development of a paediatric linked database for pharmacovigilance has support from professional stakeholders and HCPs in Scotland together with specific recommendations to inform the design of such a system. The authors would like to thank all our participants for taking part in the studies. World Health Organization. Safety of medicines —a guide to detecting and reporting adverse drug reactions. Geneva: Word Health Organiszation, 2002. BMA Board of Science. Reporting adverse drug reactions—a guide for healthcare professionals. London: British Medical Association, 2006.
. Interpreting Qualitative Data. 3rd edn. London: SAGE publication, 2006. ISD Scotland. Information Services Division (ISD). http://www.isdscotland.org (accessed 2 Mar 2015). Privacy Advisory Committee. Guidance Notes (for PAC applications). Edinburgh: NHS National Services Scotland, 2009. Wellcome Trust. Towards consensus for best practice: use of patient records from general practice for research. London: Wellcome Trust, 2009. Department of Health. The Caldicott guardian manual 2010. Leeds: Department of Health (DH/Digital Information Policy), 2010. General Medical Council. Confidentiality. London: General Medical Council, 2009. http:// http://www.gmc-uk.org/guidance/ethical_guidance/confidentiality.asp (accessed 2 Mar 2015).
. The foundations for a regional information system based on a reference register. J Inform Technol Healthcare 2006;4:154–64.
. Electronic transfer of prescription-related information: comparing views of patients, general practitioners, and pharmacists. BR J Gen Prac 2003;53:204–9. Contributors PJH was the chief investigator of the overall programme (Child Medical Records for Safer Medicines (CHIMES)), conceived the research and led writing of the proposal for funding. CB and JH were coinvestigators and led the writing of the work package which included the literature review and the empirical studies. YMH was responsible for the draft of the overall study protocol as well as the triangulation protocol, the daily study conduct and co-ordination, acquisition of data, analysis, producing tables and figures and interpretation of data. YMH drafted/co-led writing of the paper and incorporated feedback from coauthors on successive drafts. CB and JF contributed to study protocol design and subsequent analysis, and co-led the writing of the paper. All authors commented on the initial drafts of the paper and revision of successive drafts. The final version of the manuscript was approved by all authors. Funding This work was supported by the Chief Scientist Office (CHIMES Applied Research Programme, grant number ARPG/07/4). Ethics approval North of Scotland Research Ethics Service and NHS Research and Development. Data sharing statement Additional data such as the search strategy of the literature review, the study information sheets and consent forms for all studies, as well as the Delphi questionnaires or the interview and focus group topic guides, example of descriptive chart (interviews/focus groups), and examples for categorisation of statements in Delphi are available by emailing the corresponding author.